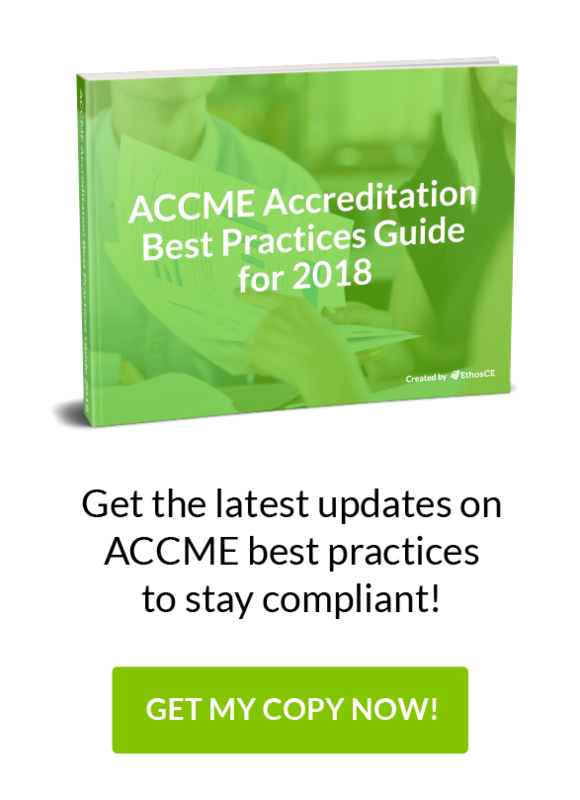 The latest update to ACCME accreditation requirements was designed to strengthen existing standards and improve CME programming data collection. As a CE coordinator, you need to be aware of the recent changes below, regardless of your accreditation status. Based on policy changes that were originally adopted in 2016, ACCME will now collect new categories of data submitted by CME providers. The number of designated AMA PRA Category 1 Credit™ and the competencies that activities were designed to address. Anonymized data that providers submit to the Program and Activity Reporting System (PARS) for research purposes. The change in this policy is based on a directive ratified in 2015. Providers receiving a decision of Probation for two consecutive accreditation requirements terms are prohibited from jointly providing activities until they regain full accreditation status. Initial applicants seeking to achieve Provisional Accreditation must comply with Criteria 1, 2, 3, and 7–12. Providers seeking full Accreditation or reaccreditation for a four-year term must comply with Criteria 1–13. Now, let’s take a look at the latest accreditation requirements and criteria. Criterion 1 The provider presents a CME mission statement that describes expected results in terms of changes in competence, performance, or patient outcomes that will result from learners’ participation in the program. Criterion 2 The provider incorporates into CME activities the educational needs that underlie learners’ professional practice gaps. Criterion 3 The provider creates activities and educational interventions that are designed to change performance, competence, or patient outcomes as described in its mission statement. Criterion 4 This criterion has been eliminated effective February 2014. Criterion 5 The provider chooses educational formats for activities and interventions that are appropriate for the setting, objectives, and anticipated results of the activity. Criterion 6 The provider develops activities and educational interventions that promote desirable physician attributes. Criterion 7 The provider develops activities and educational interventions independent of commercial influence. (SCS 1, 2, and 6). Criterion 8 The provider manages commercial support according to ACCME standards (if applicable, SCS 3 of the ACCME Standards for Commercial SupportSM). Criterion 9 The provider maintains a separation of promotion from education (SCS 4). Criterion 10 The provider promotes improvements in the quality of healthcare as a result of CME programming, not the proprietary interests of a commercial entity (SCS 5). Criterion 11 The provider analyzes changes in learners’ competence, performance, and patient outcomes. Criterion 12 The provider gathers data and conducts a program-based analysis of the degree to which the CME mission of the provider has been fulfilled. Criterion 13 The provider identifies and implements changes in the overall program (eg, planners, teachers, infrastructure, methods, resources, facilities, interventions) that are necessary to meet the CME mission. Criterion 14 This criterion has been eliminated effective February 2014. Criterion 15 This criterion has been eliminated effective February 2014. Providers that will receive accreditation decisions between November 2017 and November 2019 will have some new choices this year. Providers that will receive accreditation decisions after November 2019 must use Option B to seek Accreditation with Commendation. The following are specific requirements for Option A and B.
Criterion 17 The provider will use a variety of non-education methods to enhance physician change. These methods will be used in tandem with its activities and educational interventions (e.g., reminders, patient feedback). Criterion 18 The provider identifies which elements impacting patient outcomes are outside of the provider’s control. Criterion 19 The provider implements educational strategies to address and overcome any barriers to physician change. Criterion 20 The provider builds a network of stakeholders through collaboration and cooperation. Criterion 22 The provider is in a position to direct the scope and content of activities and educational interventions. Criterion 24 Patient or public representatives are participating in the planning and delivery of CME. Criterion 26 The provider employs health and practice data for healthcare improvement. Criterion 27 The provider addresses factors beyond clinical care that impact population health. Criterion 28 The provider collaborates with other organizations to address population health issues. Criterion 29 The provider designs CME to enhance the communication skills of learners. Criterion 30 The provider designs CME to develop the technical and procedural skills of learners. Criterion 32 The provider utilizes support strategies to promote change as an adjunct to its CME. Criterion 34 The provider consistently supports the professional development of its CME team. Criterion 35 The provider demonstrates creativity and innovation in the development of its CME program. Criterion 36 The provider demonstrates improvement in learner performance. Criterion 37 The provider shows healthcare quality improvement as a result of the CME program. Criterion 38 The provider provides evidence of the impact of the CME program on patients or their communities. There is a singular emphasis woven into the 38 criterion we just reviewed: the quality of your data will determine your application’s success. You won’t be able to present an accurate portrait of your program’s successes if you’ve been unable to monitor learner engagement and outcomes effectively. Learners are more engaged and have better knowledge retention when they use a well-designed LMS platform. When your LMS is user-friendly, learners can spend their time focused on their activities, rather than emailing tech support. Every ACCME review is focused on demonstrable positive outcomes. In order to meet ACCME standards, you’ll need a superior instructional design that accommodates the changing needs of a diverse audience. At EthosCE, we solve CME data and design problems. We work with organizations at every stage of the accreditation process. We offer instructional design consulting, web development, PARS data submissions, and an LMS that is feature-rich and user-friendly. Connect with us to find out how we can strengthen and grow your CME program.